German 10 Year Yield - Two of the most prominent reasons given as to why stocks sold off on Friday were the very weak German Markit manufacturing PMI and the flattening yield curve. They support the narrative that global growth is slowing. The German manufacturing PMI fell from 52.8 to 51.5 which was a 69 week low. 10 year yield fell below the 3 month yield. While those aren’t good news items, I think stocks fell mainly because they were way overbought. CNN fear and greed index went from 68 to 59 as the S&P 500 sold off 1.9% for its worst day since January. Nasdaq fell 2.5% and Russell 2000 fell a very sharp 3.62%. As you can see from the chart below, this week has been terrible in the past 7 years. It is the only week that has declined 7 straight years as the average return is -1.6% which is the worst performance out of any week. The S&P 500 fell 6% this week last year. The main special factor about this week is it is the week after options expiration. Lucky for us, we can look at the fundamentals to see if the economy is broken instead of just relying on average returns. Worst 2 sectors on Friday were materials and the financials as the global growth slowdown and flattening yield curve were on the minds of investors. KBW regional bank ETF fell 4.34% which extended its losing streak to 4. In that period, it has fallen 11.17%. I wouldn’t try to pick a bottom in this ETF. The yield curve is going to continue to flatten until it inverts. Global yields are cratering which is pushing down treasuries. XLU utilities ETF hit its highest level ever. It is up 12.46% year to date which is now better than the S&P 500 as it is up 11.72%. Anyone who predicted stocks would rally in the double digits this quarter and that utilities would outperform would have been called crazy. The big rally in treasuries catalyzed this. It’s very unusual for stocks to rally while treasuries soar. Therefore, the overall stock index is what’s weird, not utilities. Considering the lack of news other than the weak Markit reports and the strong existing home sales report, there wasn’t much to move markets, but treasuries had a remarkable day. I’m in awe of this move as the 10 year yield fell 10 basis points to just 2.44% which means it is only 4 points above the Fed funds rate. 30 year yield fell 9 basis points to 2.87% which shows us the decline in inflation and growth estimates has been severe. The bond market is waking up to the weak economy as growth is slowing and there no sign of a bottom yet. Finally, the 2 year yield fell 9 basis points to 2.32%, putting it 8 basis points below the Fed funds rate. Just a few days ago, I said the 10 year yield falling would quickly invert the curve versus the 2 year yield. This was because the 2 year yield couldn’t fall much below 2.3%. While the 10-2 year spread has flattened, it seems clear that the 2 year yield can fall further below the Fed funds rate. Investors quickly price in rate cuts this year. The difference between the 10 year yield and the 2 year yield is 12 basis points which is only slightly above the level it was at early in December. That spread will probably invert, but it’s irrelevant since the 10 year yield has fallen below the 3 month yield. As you can see from the chart below, since the early 1970s, the 10 year 3 month spread has forecasted every recession and has only had one false warning in 1998. Fed was in line with the Fed funds futures market for a couple days. That ended quickly as the odds for at least one rate cut this year increased to 57.9%. I think we are at an extreme moment where bond investors are getting extremely worried about this slowdown and even calling for a recession. Usually recessions don’t occur when the leading indicators are at a record high. Recessions also don’t occur right after the curve inverts. It’s quite a dichotomy to see the bond market fearing the worst while the ECRI leading index’s growth rate continues to ramp. This weekly leading index is making it abundantly clear that the slowdown will end in Q2 or Q3 as the yearly growth rate improved from -2.9% to -2.3%. I’m interested to see when ECRI the company starts promoting the bullish narrative. Comps will continue to get easier which should push growth positive in April or May. The index increased 0.3 points to 145.6, so it wasn’t only comps that drove growth higher. As expected, the February coincident indicator’s growth rate fell from 2.4% to 2.2%. Clearly, growth will bottom in Q2 or Q3 which means the coincident indicator has further room to fall. Growth could be negative in the early summer. The yield curve inverted which suggests a recession is coming in the next 1-2 years. 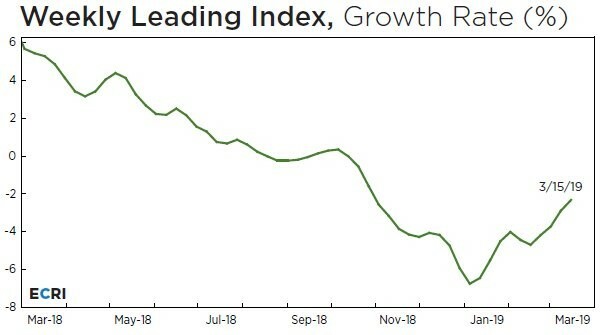 However, the ECRI leading index’s growth rate has bottomed and is accelerating higher. Yearly growth will soon be positive. That suggests, cyclically, the economy should rebound in early 2020. That’s far from a recession. The near term yields have fallen which imply markets are expecting a rate cut. I don’t see a cut coming because I’m staring to get optimistic about the economy in the next 12-18 months.